Recognising that your horse may not have the strength to perform the work you are asking for is key to ensuring he remains sound and willing throughout his Dressage career. Consider this: If you embarked on a program of stretching, joined a yoga or pilates class or even joined a gym how would you feel after your first session? Perhaps a little sore, perhaps a little tired. How long could you do and how often would you need to go before it became easier and enjoyable? What would happen if you jumped in at the deep end and did the ‘body blast’ class? My guess is you would be laid up for a few days and probably wouldn’t want to go again. It is down to you to ensure that your horse is physically capable of performing the work you ask of him, particularly as the demands increase. You will therefore, need to incorporate some strength training into your schooling work. Improvements in muscular strength not only enhance performance, but also prevent injuries by reducing the risk of muscular strains. All horses but particularly dressage horses that are being prepared for competition need to build endurance in their muscles in order to allow them to perform for longer periods without becoming fatigued. 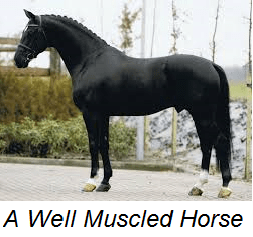 We all know that if a horse (or a rider for that matter) performs the same amount of exercise every day, he will reach and maintain a certain level of fitness and strength, but will certainly not increase his fitness or strength. Strength will only be achieved through a gradual increase in the amount or intensity of the exercise and, once achieved, the new workload should be maintained for a while in order for the body to adapt before another increase is introduced. It follows then that if the increased level of exercise is reduced for any reason (injury, illness, holiday) the changes in muscle strength are reversed. The physical effect of strenuous exercise produces microscopic damage within the muscle tissue which ordinarily heals within 2 days. This is why we feel the soreness in our muscles the next day but often more so, on day two. It is through the repeated cycle of damage and repair over time, that the muscles build strength. It helps to think about this damage/repair scenario so that you can build empathy with your horse and work out your training program accordingly. Insufficient strength training fails to produce well adapted muscles, but equally too much or insufficient recovery time between workouts will inevitably lead to injuries and fatigue. 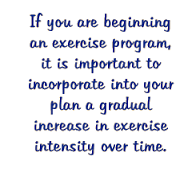 by increasing the intensity rather than the duration of exercise, so the muscles work harder not longer. For example by asking for collection for a few steps only in the early stages of teaching collection. by increasing the number of repetitions, so the muscles work longer rather than harder. For example by gradually increasing the number of collected steps once the horse is strong enough to maintain the initial number with ease. Where do I start with Strength Training? Using interval training (IT) involves a period of intense exercise followed by a recovery interval, thus allowing recovery of the heart, respiratory rates and dissipation of accumulated lactic acid in the muscles. A word of caution here though, I have written previously about muscle memory in the rider. Fact is, if the technique you employ is not correct, you will be training the wrong muscles in your horse. followed by a circle at working trot. So by using this method you can see that it will take a number of weeks to be able to sustain collected trot for any extended period of time. However, as soon as fatigue occurs, the strength training exercise must cease and you must re-assess your repetitions or number of steps accordingly. Specific work that will help your horse become stronger includes hill work. Particularly, pay attention to his pushing power on the uphill slope and his carrying power downhill. The gradients develop power in the hindquarters. A gradual downhill gradient is particularly useful for the development of collection because the effort required to establish and maintain collection on a downhill slope is exaggerated compared with working on the flat. When the horse goes back to working on the flat, the work seems much easier. Transitions are the very foundation for this type of work. Good transitions are quite a gentle way to encourage your horse to rebalance himself and activate the hind leg. Thing is, you must concentrate on correctness of your transitions. Going from walk to trot is not necessarily a good transition. Your horse must not only be strong enough, he must also listen to your aids. The downward transition from trot to walk involves the horse stepping under from behind to transfer the weight backward. This is the really valuable transition to help him become lighter in your hand. Half halts work to rebalance your horse, enabling him to take more weight onto his hind legs is also invaluable to strengthening the muscles. To understand more about the half halt see here. There is no ‘one size fits all’ approach to strength training. To get the most from your program you will need to adopt an individual approach for your horse. This means taking account of his age; his training history; the level you are working at; the frequency of his exercise regime and any previous injuries that may affect performance or soundness. Suppleness and strength, however, are the cornerstone of your training progression. Strength training is an area that is often neglected nor even considered. Don’t be that rider who expects your horse to perform just because you ask it to, think about his gymnastic development, his abilities and help him as best you possibly can with a plan build his strength. Only then will he work willingly with you to achieve your best performances. Have you enjoyed this post? Why not share it with your fellow dressage enthusiasts? Check out the new email and print buttons below. Now you can email these posts to your fellow dressage enthusiasts, or print them to take to the stables! Pretty cool eh? THINK ABOUT YOURSELF - IT'S A DANCE! I wanted to say, as a new subscriber, I am really enjoying your posts. They are easy to understand, especially sitting in my lounge chair at home. I can’t wait to try this out next time I ride. Thank you. I love learning more about this passion we share. I am actually plnnaing on attending Meredith Manor in Ogden, WV in fall 2009. Their riding master program consists of two riding class(western or english, or both), two career area classes(training, teaching, farrier schooling, breeding, massage therapy, equine sciences or equine business and management), one showing class(dressage, jumping, english or western), a theory class and horse and barn care. The cost per quarter for the Riding master program is roughly around $ 7000 and they are an accredited school so you can transfer your credits from other colleges to and from Meredith Manor. They also offer financial aid. I am actually going there on Thursday for a tour. Im sooo excited. Their website is MeredithManor.com. They only accept 75 students a quarter so you get alot of hands on time and 90% of your studies are spent on horseback. I’m going there for training, breeding, dressage, jumping, western and english pleasure and their farrier school and if I take classes all year round(including summers) I’ll only be going there for three years. Of course that is unless I find some other stuff that interests me while I’m there.To get information about prices for classes etc you will have to order their catalog but they have all the classes they offer on their website.Good Luck!! !